Sago is washed and soaked in yogurt overnight or for around 6 hours. The mixture is seasoned with spices and deep fried in oil till golden brown in color. Serve sago yogurt vada immediately with any chutney or pickle of your choice. 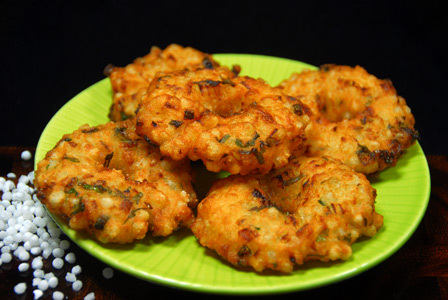 Makes: around 5 Sago Yogurt Vada. In a mixing bowl, mix together washed sago, yogurt, around 5 tablespoons of water. Mix well and let the sago soak for around 6 – 8 hours. Add rice flour, onion, green chiles, cumin seeds, cilantro and salt to the soaked sago mixture. Make the mixture into soft but little wet mixture that can turn into soft ball if desired. Adjust rice flour if necessary. Wash left palm and let it be wet all through the process. Using right hand, make lemon sized ball with sago yogurt mixture. Place in on left palm and lightly flatten it. Make a small hole in the middle, remove from left palm and slowly leave the sago yogurt disk in hot oil. 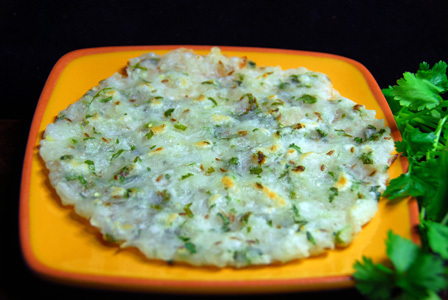 Make 2 – 4 such vada depending on the surface space in the pan. Fry sago yogurt vada on both sides until golden brown in color. Remove the fried sago yogurt vada onto absorbent paper. Repeat the same with any remaining sago yogurt mixture. Serve sago yogurt vada immediately with any chutney or pickle of your choice. Notes: Make sure to soak the sago well. Suggestions: If vada is not cooked well inside, put it back into hot oil and fry on low flame till cooked inside and crisp outside. Variations: You can also check other vada recipes here. Other Names: Sago Yogurt Vada, Saggu Biyyam Vadalu. For sabudana upma, sago is soaked for around an hour and strained. They are then briefly cooked along with whole spices, onion and potato. Dish is finished with lemon juice and serve sago upma immediately. Makes: around 2 Servings of Sago Upma. Wash sabudana under water for few times and soak them in water for around an hour. Strain the sago and leave it for another hour or so till sago pearls are moist but separate and don’t stick to each other. Remove stems, wash and chop green chiles. Clean, wash and finely chop cilantro leaves. Peel, wash and chop potato into small cubes and soak the cubes in water until required. Heat oil in a pan, add add all talimpu ingredients in order. When cumin seeds starts to change color, add chopped green chiles, onion, potato and salt. Cook covered on medium flame until potato turns just soft but whole. Uncover, stir for a minute and stir in soaked sago pearls, cilantro, turmeric powder and sufficient salt (if necessary). Mix carefully and cook for 3 – 5 minutes until sago pearls change color and become translucent. Remove from heat, add lemon juice. Notes: Make sure to dry the sabudana after soaking to avoid getting mashed up in the khichdi. 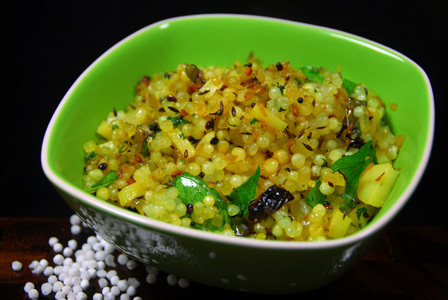 Suggestions: Sabudana khichdi is little grainy – soak sago for longer next time. Sabudana khichdi is mushy – reduce the soaking time and increase the drying time. Variations: Check other sabudana recipes here. Other Names: Sago Upma, Saggu Biyyam Upma. Sago / sabudana is cooked in milk first since it takes long time to cook. 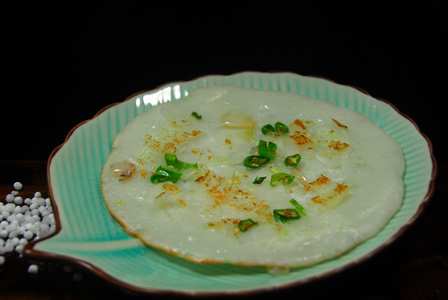 Once sago is translucent and cooked, vermicelli added and cooked briefly. 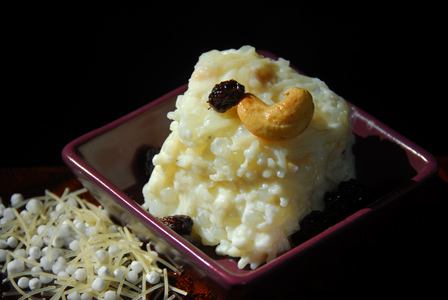 Vermicelli sago halwa is flavored with cardamom and garnished with dry fruits. Serve vermicelli sago halwa hot or cold. Makes: around 4 Servings of Vermicelli Sago Halwa. Crush the cardamom and remove all the black seeds. Pound the black cardamom seeds into powder and keep aside. Heat ghee in a small pan, add cashews and raisins. Fry till cashews turn golden brown and remove from heat. Heat milk in a sauce pot on medium heat. Add sago and boil the milk till sago turns translucent (around 20 minutes). Keep stirring the milk frequently to avoid sticking to bottom of the pan. Once sago is transparent, stir in vermicelli and cardamom powder. Boil for a minute or two or until the mixture is very thick and remove from heat. After removing from heat, immediately stir in sugar and fried cashews and raisins. Pour the vermicelli sago mixture onto a wide plate and let it cool to room temperature. Once the halwa hardens, cut into pieces and serve vermicelli sago halwa. Notes: Make sure not to burn the milk. Suggestions: Make sure sago is cooked well before adding sugar. Variations: You can also serve the cooked halwa hot before it cools down and becomes solid. Add your choice of dry fruits to the vermicelli sago halwa. Other Names: Vermicelli Sago Halwa. Makes: around 2 Servings of Sago Rotti. Notes: Make sure sago is soaked well. Suggestions: If sago is not soaked well, add more water and leave it aside for another half an hour. Variations: Check other recipes with sabudana here. Other Names: Sago Rotti, Saggubiyyam Rotti, Sabudana Rotti.